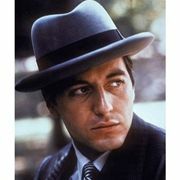 ContempoSuits.com is the place to get a Michael Corleone Hat as well as Bright Colored Brim Hats such as Godfather Hats on Sale. If you're a Godfather Movie nut like me, you know exactly where this mens dress hat gets it name from. It's the scene from The Godfather, the first movie when Michael Corleone comes back from Italy after being on the lam from killing the police captain and Solazo. He meets up with Kaye while she is tending her young school children wearing that style brim hat. A Godfather hat is the type of hat that Al Pacino wore playing Michael Corleone in the movie. 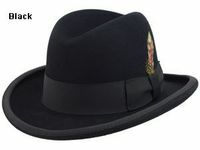 Originally called a Homburg Dress Hat. 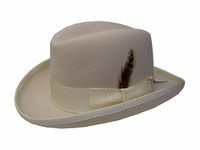 Now known as the Godfather hat.We have Homburg Hats or Godfather Hats which is what everyone calls these fashionable looking brim hats now in all kinds of bright and bold fashion colors that are great to be seen wearing with Alligator Shoes. Almost every mens Double Breasted Suit and Walking Suit we sell has an available brim hat like a Homburg Hat and Godfather Hat to match. 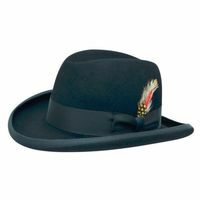 Putting a homburg hat aka the godfather hat on your head really finishes your look. 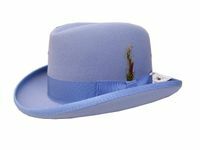 All of our brim hats like Godfather Hats look and feel fantastic.We always have bright colored Godfather Hats on Sale. 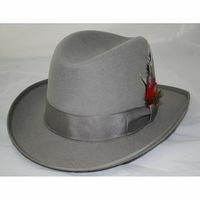 If you are looking for cheap godfather hats, ContempoSuits.com is the place for you. 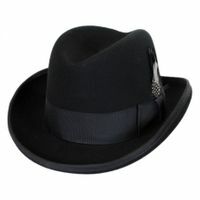 Shopping Online for discount Godfather Hats and Homburg Hats is easy at ContempoSuits.com with Free Shipping over $99. You should also check out our huge selection of affordable Mens Suits and Mens Blazers. Read More about Mens Clothing Suits Here. If you're a fan of the HBO hit show "Boardwalk Empire", you'll see the main character Nucky Thompson wearing nothing but Homburg Hats. Shop for Crocodile Shoes Here. Shop Here for Belvedere Shoes. 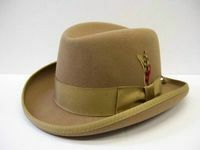 Read More about Homburg Hats. Have you checked out our Stacy Adams Shoes Department. Don't forget to checkout our selection of Stacy Adams Suits Here. If you really appreciate nicer menswear consider Silversilk Clothing. Checkout our Huge Collection of Urban Men Suits Here. If Style is What You Crave, checkout our Huge Selection of Mens Fashion Suits. Get your 1940s urban retro style going with our fancy Zoot Suits. Dress hats are called different things.Some people call them Godfathers, others call them Church Hats.The original name for Godfather Hat is called a Homburg. It wasn't until the Al Pacino wore one in the first Godfather Movie that the name changed. I've heard some people call them Fedoras which is wrong because Fedora dress hats are a different style dress hat with a similar purpose.People from the Island call them Felt Hats and Many people who are over 40 refer to them as Brims. 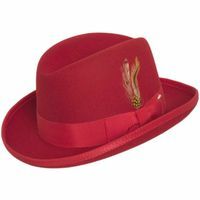 One of our best selling color godfather hats is a red godfather hat. The reason is simple because so many people love the brightness that the color red adds to their ensemble whether they are wearing a red suit or just need a red color godfather hat to top it all off. Whether you've picked out a rust color fashion suit or a rust color walking suit, let's face it. 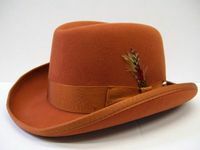 You can't ignore the fact that you need to wear a hat on your head like a rust color godfather hat. A rust godfather hat just makes the ensemble look so much better than if you went without one. 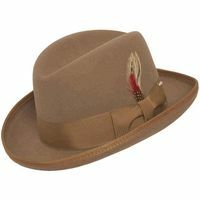 Need a Homburg or Godfather hat in the color beige or camel. Well you've found the right place to find a great looking fine quality godfather hat. 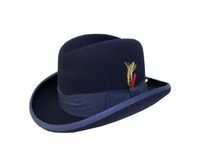 With a satin hat lining and leather hat band, you'll be more than pleased with quality of the all wool felt godfather hat. Besides black, white is our best selling godfather hat color and the reason is clear. We have more people wearing the color white than ever before. 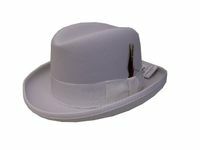 You can wear a white color godfather hat as either a contrasting color or a matching color. Since ContempoSuits.com specializes in mens suit fashion, you shouldn't be surprised by the fact that you'll find godfather hats in fashion colors either like light blue. So, if you're shopping for a light blue suit, don't forget about the light blue godfather hat to match. Just because you're wearing a cream color suit doesn't mean that you can't finish the look that you're driving for. Just pop a cream color godfather hat on your head and show people that style is not something that everyone knows how to use to their advantage. When you have a rich color suit that has style to it like the color burgundy, show people that style is something that you were born with and top your suit off with a burgundy color godfather hat with the grosgrain hat band. Godfather hats whether you called them a homburg are just a great finishing touch. 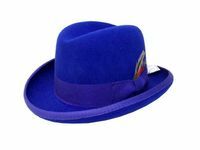 Now you don't need fashion ID to wear a royal blue godfather hat but it will help if you're the type of person that has the confidence available to make your look work. 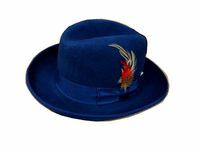 Made out of 100% wool felt and lined in luxurious satin, a royal blue godfather just does the trick. If you've never owned a Godfather hat or a Homburg hat before, one of the first colors to add to your collection should be grey since grey is a neutral color that you can match with much of your suit wardrobe. With a leather headband and black grosgrain headband, you will feel confident that you made the right choice. 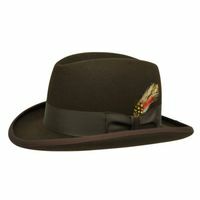 You don't need to be Michael Corleone to appreciate how good a brown color godfather hat will look on your head. Godfather hats have a classy timeless look that bring you back to a time when dressing properly when you go out was tantamount to being fully dressed. You know that if you own any suits at all in your closet, there is strong possibility that there is a navy blue suit or two on hangers as well which is why it might just be a good idea to add a navy blue godfather hat to your closet to keep your navy blue suits company. For a fashion color that brings out the best in your suit wardrobe, silver does much to add visual pop when style counts. A silver color godfather hat can be worn with many different color suits you own just by hooking it up the right way with some creativity. Whether you're shopping online for an Olive godfather hat or an Olive Homburg hat, you'll be more than pleased with way you look in this olive green godfather hat by Capas. 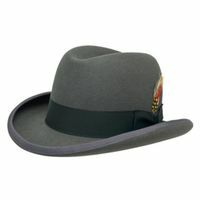 Godfather hats have always had a more dressy appearance than other dress hats and this olive homburg is no exception. 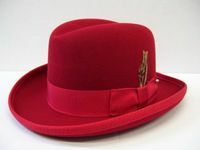 Don't just go to a black or brown hat when the color you really need is a red color godfather homburg hat. Sometimes you just have to take the plunge and make the decision which really makes your suit outfit pop with a red godfather hat to bring your look to the top.